How was Natalie to know that the decision she was about to make between two potential dates, would forever be a pivotal point in her life? That it would mark the time where childhood innocence ended? How could she even imagine that the wrong decision would send her life spiralling into the stuff of nightmares from where she might not come out alive? Life takes a cruel twist of fate when Natalie, a completely average [almost] 16 year old, is forced to make a split-second decision… a decision that will change her future and forever alter her perception of trust, love and the realities of life. 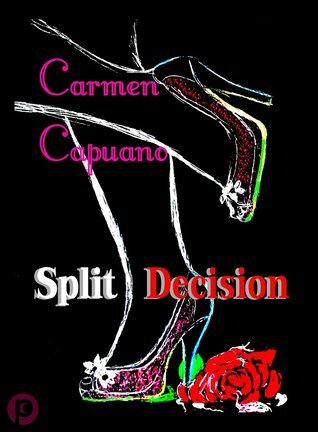 Split Decision, essentially a coming-of-age novel, is both brilliant and brutal – brilliant in its execution and brutal in the sensitive subject matter it explores. The decision Natalie makes impacts on many and she is not the same person at the end of the story as she is at the beginning… It is the second book that I have read by the author Carmen Capuano, the first being Ascension, a dystopian thriller (click on the book title for the review). Although the subject matter is completerly different, I found the story just as engaging and thought- provoking. The characters, the young people and the adults, were all very believable and the author is to be congratulated on using the events to illustrate their personal growth and changing family dynamics.The plot is cleverly and expertly written and certainly had me guessing and questioning my own preconceptions and prejudices. All in all a super read.